Relyence FMEA supports a variety of FMEA types including Design FMEAs (DFMEA), Process FMEAs (PFMEA), Manufacturing FMEAs, Software FMEAs, Services FMEAs, and piece-part FMECAs. The integration of both Process Flow Diagrams and Control Plans with PFMEAs provides unparalleled advantages. Customization capabilities offer the flexibility you need to tailor your FMEA Worksheets to your requirements. Relyence’s failure analysis software for design and process FMEAs provides an unparalleled interface for failure mode assessment and evaluation. Relyence FMEA allows you to perform DFMEAs, PFMEAs, and FMECAs. Custom FMEAs supporting failure mode analysis any way you choose. Offering built-in support for widely accepted FMEA standards, Relyence FMEA enables quick start-up and comprehensive analysis capabilities. Select from the supplied templates for Design FMEAs, Process FMEAs, and FMECAs supporting SAE J1739 and ARP5580, AIAG methodologies, and MIL-STD-1629A, or customize a template to suit your unique needs. And piece-part FMECAs can be automated with Relyence’s built-in support of the FMD-2016 Failure Mode Distributions database. 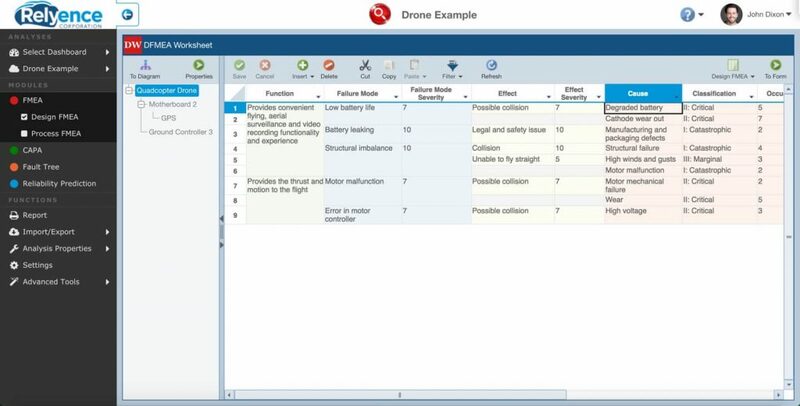 AIAG FMEA Software: Performing failure mode and effect analysis using Relyence software to meet the standards set by the Automotive Industry Action Group — or AIAG — allows automakers, manufacturers, suppliers, retailers, and service providers to work together toward a more efficient, safe, and resilient supply chain. Founded by the North American automakers Ford, Chrysler, and General Motors, the AIAG’s membership has grown substantially. Today, it includes overseas auto manufacturers such as Nissan, Toyota, and Honda, as well as more than 900 automotive experts who work non-competitively to continually develop best practices in the auto industry. SAE FMEA Software: With its ranks exceeding 120,000 engineering and technical members, the former Society of Automotive Engineers — now known as SAE International — develops standards aimed at making industries associated with land, sea, air and space transportation — such as the automotive, aerospace and commercial vehicle sectors — safer and more reliable. Using Relyence’s SAE standard compatible FMEA software enables professionals tasked with risk assessment to do their jobs in a highly accurate and efficient manner. MIL-STD 1629A FMECA Software: The Department of Defense standard, MIL-STD 1629A, adds criticality analysis to traditional FMEAs. For this reason, MIL-STD-1629 is used in a wide range of industries and is not limited to military applications. MIL-STD-1629 FMECAs provide the groundwork that give professionals a comprehensive method of failure mode analysis down to individual components within systems. 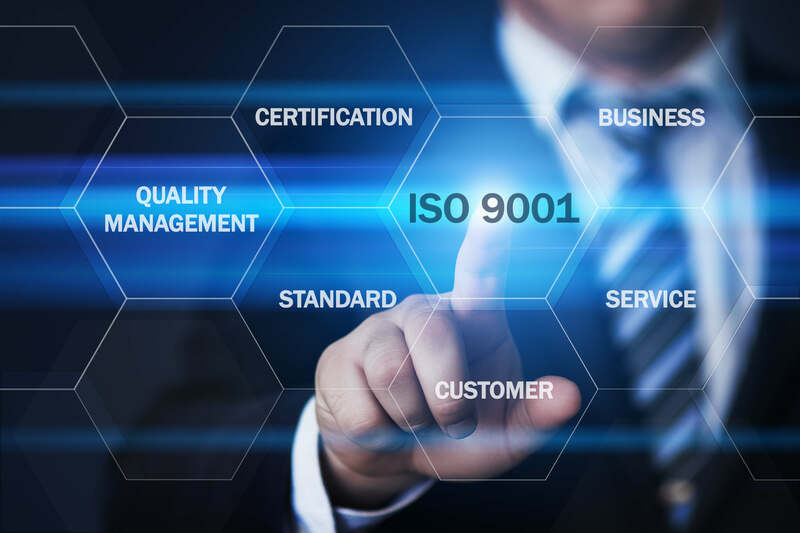 ISO Standards Compliance: As one of the largest and most recognized global standardization bodies, the International Organization for Standardization — or ISO — acts in a proactive manner to set standards aimed at supporting the design and manufacture of products that are reliable, safe, and aim for continual quality improvement. 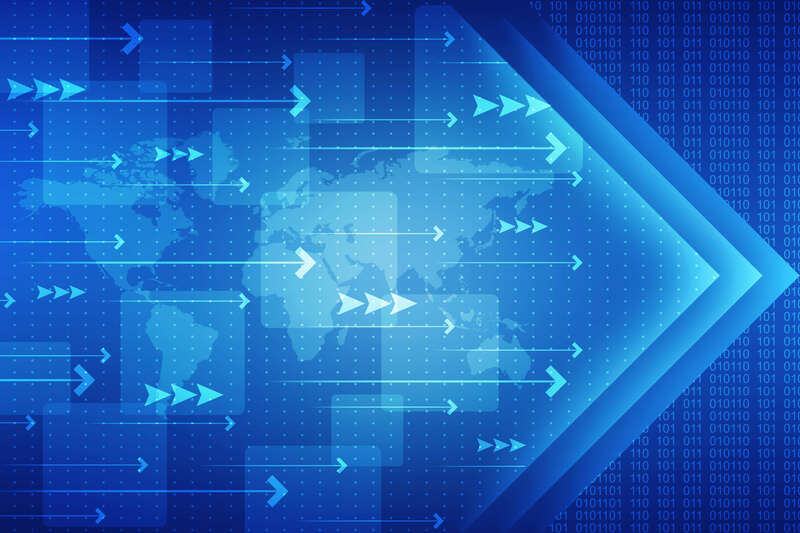 FMEAs and FMECAs are often part of an organizations ISO compliance requirements, and Relyence FMEA software is a vital tool to help to ensure those goals are achieved. Use a built-in standard FMEA process from SAE, AIAG, ISO, or MIL, or customize your own. Design your own PFDs in either a graphical or a spreadsheet format as a powerful aid in visually organizing your process. Process Flow Diagrams (PFDs) are a key component of a structured and well-planned Process FMEA. Relyence FMEA provides an easy-to-navigate interface for your PFDs, including both a fully functional graphical interface as well as a spreadsheet interface. You can choose to use either view or both views – switching between views with a simple click. Relyence FMEA’s unique always-in-sync™ technology ensures that your PFDs remain in sync with your PFMEA Worksheets and your Process Control Plans so that information across your entire PFMEA process remains intact and controlled. A Control Plan (CP), also referred to as a Process Control Plan (PCP), is an organized methodology ensuring that your quality standards and continual process improvement objectives are achieved. 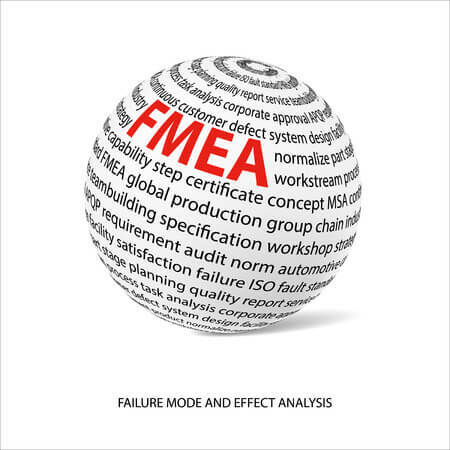 Relyence FMEA can be employed to effectively manage and organize your Control Plans. Or, Relyence FMEA can manage your entire PFMEA process by taking advantage of the unique always-in-sync™ technology to organize your control plans along with your PFDs and PFMEA Worksheets. Relyence FMEA maintains the data flow from one step of your PFMEA process to the next, keeping track of product and process characteristics, prevention and detection controls, and process steps. Manage and control your process with Relyence FMEA's Control Plans, automatically linking them with your PFDs and PFMEAs. Relyence FMEA Worksheets can be customized to your requirements. Relyence FMEA offers complete control of all your FMEA data entry worksheets. You can choose to start with one of our built-in templates based on a FMEA standard and modify it to suit your needs. Alternatively, you can create your own FMEA Worksheet using the data elements you desire. You can have multiple templates and can easily switch back and forth between them. You can share worksheets across teams, or even create individual custom worksheets. 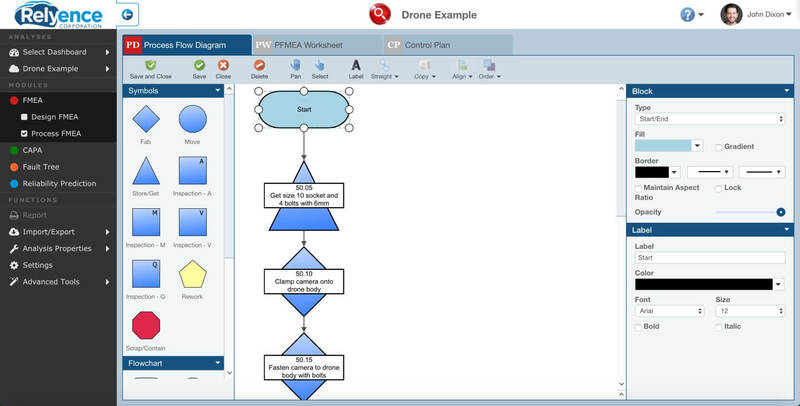 Customization extends across all FMEA entities: Design FMEA Worksheets, Process FMEA Worksheets, FMECA Worksheets, Process Flow Diagram Worksheets, and Control Plans. Excel templates and spreadsheets used to perform DFMEA or PFMEAs are simply no match for the precision and automated power of Relyence software. Due to both the sheer amount of data and the collaborative nature involved in DFMEAs and PFMEAs, the manual processes required with Excel mean that your FMEAs are more error prone, less consistent, less organized, and much more difficult for your team to manage, maintain, and update. Relyence FMEA software with always-in-sync™ technology provides a level of automation to your failure mode analyses that ensure your FMEAs are complete and controlled. 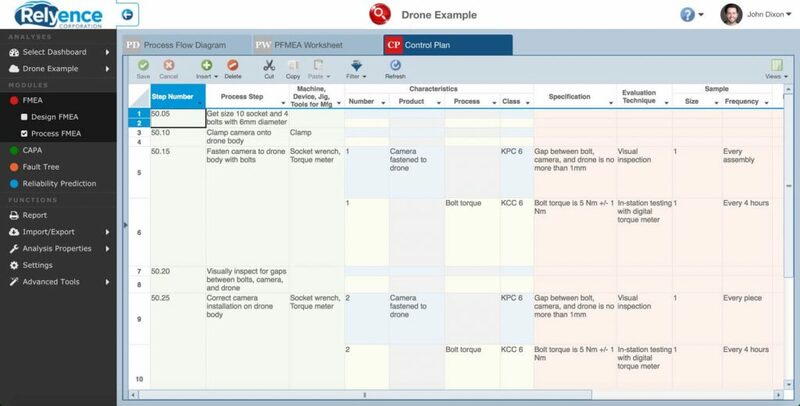 In addition, our intuitive interface, streamlined Worksheets, and an array of features to make your job easier, you FMEA tasks are guaranteed to be efficient as well as effective. Relyence’s unique and powerful Knowledge Bank offers an unparalleled way to capture, store, and reuse your FMEA data. Capturing lessons learned in a searchable and encompassing databank means your FMEA knowledge is maintained and continually builds for maximizing your team’s potential. The available Audit Trail feature provides the ability to capture, track, or review all FMEA modifications and edits, which is especially important in compliance-based efforts. Read more: Move over Excel! Experience the power of Relyence FMEA compared to Excel today.